When you are working out, what is the worst thing that can happen after you take a few sips of water or any other intraworkout drink? Cramps. Nothing can kill a workout faster than some rib thumping cramps. Because of this, intelligently formulated 'sports drinks should have a verified osmolarity which is a key indicator of how fast it can clear the stomach, thus potentially avoiding cramps. The Gaspari Nutrition R&D Team is acutely aware of this which is why they developed Osm Technology. This 'new way' of looking at carbohydrate drinks utilizes a proprietary method of tuning the electrolytes in solution with pure cyclic dextrin to get an optimal osmolality (mOsm). Remember, lower osmolality = faster gastric clearance. To be real, we knew full well we had to have a lower osmolarity than our competition. So, we spent the money and had our entire competitor products tested at a 3rd party laboratory to see where we stood. With some fine tuning using Osm Technology, Glycofuse is confirmed to have an outstanding osmolality compared to just about every product on the market, including the biggest brands out there. They can't hide from the facts. If you're a 'carbo-phobe' then you really aren't concerned with performance, recovery, or lean muscle. True Athletes understand the importance of carbohydrates and embrace them. Whether they are carb-loading before a competition, rolling on the mat, banging out a WOD, slamming a drink during a race, or refueling after a tough training session they know that in order to get to where they want to be they need the energy to get there. Glycogen is what helps fuel your workouts and keep muscles volumized. There is no way around that! Here's the reality of the situation. Not all carbs are created equal. There's a lot of cleverly labeled and modified maltodextrin on the market claiming to be some technical polysaccharide. Or, there's plain old cornstarch relabeled as super-duper muscle engorging waxy maize. Most of these aren't proven to do anything except deliver false hopes as opposed to having multiple clinical studies in real athletes to prove what it is they're claiming. 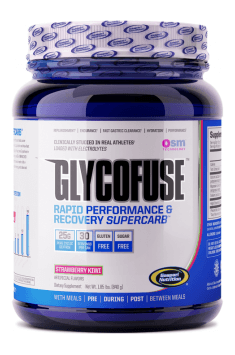 This is why Gaspari Nutrition chose highly branched cluster dextrin for what will become the gold standard of recovery and performance drinks, GLYCOFUSE. This high molecular weight carbohydrate has a special helical structure which gives it unique properties unlike many of the corn starches or polysaccharides out there. We'll be real with you and say this stuff isn't cheap, but you certainly pay for what you get. For an athlete like you who takes performance seriously we know you would expect nothing less from us except for REAL RESULTS, REAL FAST. Your need for extra electrolytes is based on how often, how long, and how hard you train. To give you an edge Gaspari Nutrition partnered up with Albion Labs where science and patented technology have been combined to create crucial electrolytes in a form the body can readily assimilate. Glycofuse bears this seal and is the first Gold Medallion certified carbohydrate powder on the market! One portion (28 g) during or after exercise. The most optimal solution is to adjust to the manufacturer's recommendations. At other times better complement carbohydrates with regular meals. Citric Acid, Malic Acid, Natural And Artificial Flavors, Sucralose, Acesulfame Potassium, Beta Carotene (Color). A strong pre-workout comprehensively supporting physical abilities and intensifying weight loss. Pre-workout supplement. It improves strength, stamina and vascularity. Stimulant free.